Not a big fan of vegetables? Roasting them is a great way to make them taste delicious. You can add any spices you like. Try our roasted root vegetables, roasted broccoli, or roasted cabbage recipes for other ideas! Preheat oven to 400°F. Clean carrots well, and peel with vegetable peeler if you'd like. Cut carrots in half if large, and then into about 3 in pieces. Add the cut carrots to a large bowl. Add the remaining ingredients and toss well. 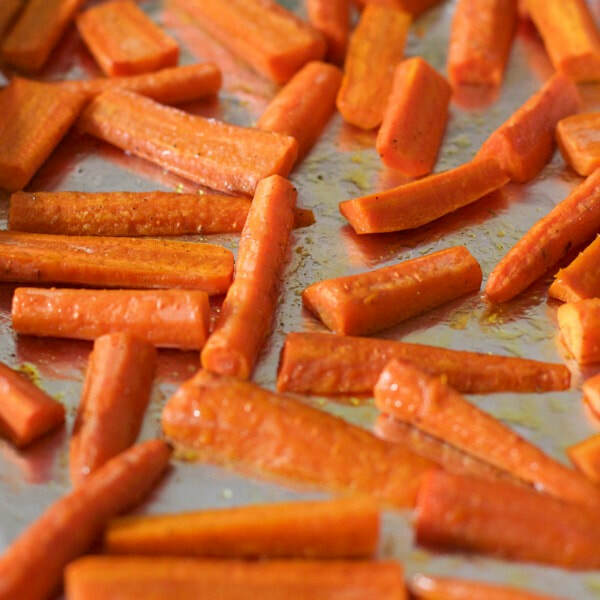 Spread the seasoned carrots evenly on a sheet pan.